FULL TIMEThe Giants with a huge 68 point win over the Saints. They kicked a record seven super goals, with three being kicked by Shiels. A great day for the Greater Western Sydney Giants. The Giants will have some momentum, going into the 2014 season, on the back of a huge win here today. GOAL SAINTSLee marks 40m from goal near the boundary. He takes the set shot on goal and kicks his second goal of the day. Hunt is on the bench just getting his knee checked out by the physio. He doesn't look too bad though, only a minor concern for the Giants. BEHIND GIANTSLamb snaps at goal from 50m, but it drifts away to the right for a point. BEHIND GIANTSLamb takes a shot on goal from inside 50, but can only add a point to the scoreboard. BEHIND SAINTSSchneider attempts to cover himself with glory and he may have to be happy with just the thought as he misses the goal. BEHIND SAINTSWebster has a wild snap at goal and misses. The Saints only trail by 73 points now. The only interest left in this contest, is whether the Giants can post their first ever 100 point victory. GOAL SAINTSMontagna takes it from the boundary, has a snap at goal and he drills it. BEHIND GIANTSSmith with a shot on goal, praying that the breeze swings it around, but unfortunately for him, it didn't swing around enough. The Giants have been all over the Saints and look like that they are targeting the 100 point barrier. GOAL GIANTSFrost demands the ball as he runs through, throws the ball onto his boot and he kicks a goal. The Giants by 79 points. SUPER GOAL GIANTSShiels gathers the handball, he unloads from 55m from goal and he kicks an AFL record of three super goals in a game. GOAL SAINTSLee gets out to a lead and marks 30m from goal on the boundary. He kicks it straight through the middle for a goal. Weller drops the mark he should have taken deep in defence, raising the pressure for the Saints defence. BEHIND GIANTSWard fires a shot at goal, but it bounces the wrong side of goal and through for a point it goes. Lee has been awfully quiet today, with only 5 possessions for the game. SUPER GOAL GIANTSShiel unloads from outside 50 and it bounces through for his second super goal of the day. The Giants are back out to a 69 point lead. GOAL SAINTSFinally, the Saints get one! Curren marks from the kick in, has a shot on goal and it is good. The Saints trail by 60 points. BEHIND SAINTSNewnes gathers it from the kick in, has a shot at goal and once again it is only a minor score for the Saints. BEHIND SAINTSMaister comes out and takes the mark 40m from goal, he swings it away to the left for a point. The Saints are all about having something to hang their hat on now, with winning the game something close to a miracle now. We are back for the final term, as rumours start to circulate that Hayes has injured his left hamstring, with St Kilda's day going from bad to worse. 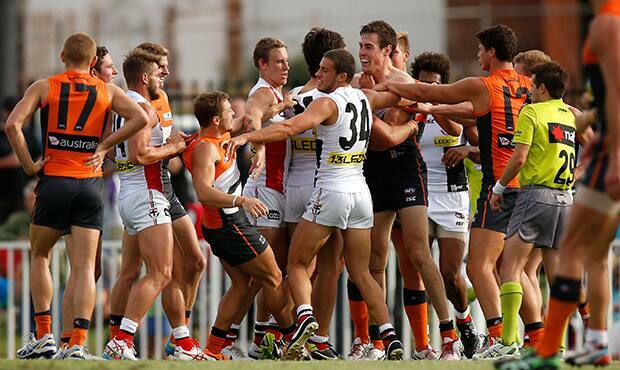 THREE QUARTER TIMEThe Giants win another quarter, as they extend their lead over the Saints to 68 points. BEHIND SAINTSHayes bursts from the pack, attempts to kick a goal, but it bounces away for a point. GOAL GIANTSPalmer takes the spill of the ball, kicks around the corner from 30m and he shows the crowd that he has kicked one goal. The GWS are on par at the moment, to record their biggest ever win in their short time in the AFL. The ball is being chipped around all over the ground, but some skill errors are starting to creep into general play. BEHIND GIANTSSmith with a quick snap at goal as it goes through for a minor score. BEHIND SAINTSThe ball comes off hands and through for a rushed behind it goes through for the Saints. The sting looks to have gone out of this game, with the Saints not offering much of a fight at the moment. The Saints need to continue to chip away at the Giants lead as could be facing a three figure demolition otherwise. Cameron comes out and takes a mark 45m out on the boundary. This time he misses dreadfully and does not register a score. The Giants look a much improved outfit, with their mixture of new experience on the list. They have added Mumford, Shaw and Hunt, to steady the growing talent. GOAL SAINTSDunstan comes out and takes the mark 30m from goal and he finally breaks the Giants streak of 10 unanswered goals, by kicking a goal for the Saints. The Saints are finally showing something after going missing for about a quarter and half. BEHIND SAINTSBillings takes the mark 35m from goal on a slight angle. He comes in and gives it a bit of a hook to the right for a point. 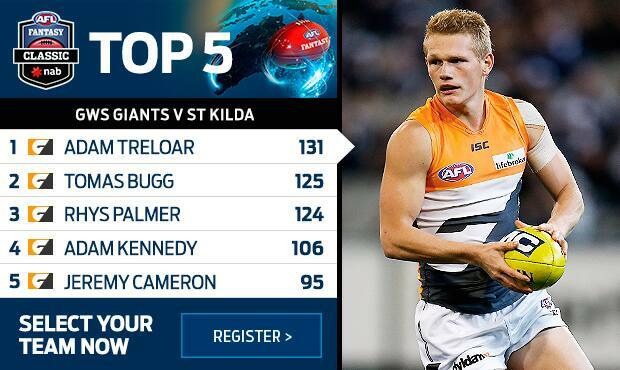 It has been all Giants since about five minutes into the second term, kicking 10 unanswered goals. GOAL GIANTSCameron drops the mark in the goal square, but he gets front position, as he boots it off the ground for another goal. Giants lead by 70 points. GOAL GIANTSCameron comes out and takes a rolling mark 40m from a 45 degree angle. He keeps his kick straight to kick his fourth goal of the game. The Giants are pushing it forward through Mumford, they are looking likely to be the first time to get onto the scoreboard in the second half. No movement on the scoreboard as yet from either side, as we have a scrappy opening to the second half. We are back for the second half of the match, can the Saints improve their situation on the scoreboard? HALF TIMEThe Giants go into the main break holding a giant 58 point lead over the Saints. 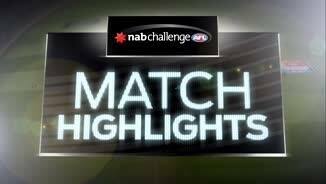 BEHIND GIANTSLamb is awarded a free kick for holding the ball against the Saints, 30m from goal but from a difficult angle. He squeezes it through for a point. BEHIND SAINTSRay gathers it inside 50, he attempts to kick it around his body for goal but can only manage a point. 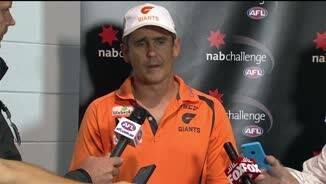 The instruction from new Giants coach at quarter time must have been to kick it long and go for the super goal. SUPER GOAL GIANTSCameron kicks the Giants eight unanswered goal as well as a record fifth super goal for the term. Bad news for the Saints with Delaney being subbed out of the game due to a shoulder injury. It doesn't look too serious though. SUPER GOAL GIANTSSuper goal number four for the Giants, as Hoskin-Elliott unloads from outside 50 as it sails through for a goal. The Giants will go into the main break holding their biggest ever half time lead. The Saints appear to have taken their foot off the gas at the moment. GOAL GIANTSThe umpire allows the advantage as Lamb grabs the ball unmarked inside 50, he runs into an open goal and makes it a 40 point lead for the Giants. SUPER GOAL GIANTSShiel takes the spill of the ball, loads up from 55m and kicks the Giant's third super goal of the term. The Saints need to cut the Giants off around half forward as they are using the breeze to their advantage well. GOAL GIANTSHampton with a hand ball over the top to Bugg, who runs to 50 and unloads for goal, it is through for a goal. The Giants by 25 points. SUPER GOAL GIANTSHaynes gathers it 55m from goal he kicks it deep inside the forward line, as it is shepherded through, as it bounces through for a super goal. Kelly gathers it on the boundary, he shoots for goal and kicks it across the face of goal and it bounces out for a throw in. 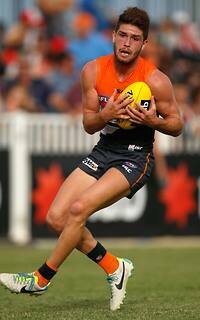 Hunt has been involved in everything across half back, he will prove to be a huge asset in the Giants backline. The Saints are finding it hard to get past half forward at the moment, with the Giants defenders all over them like a cheap suit. BEHIND GIANTSHampton has a quick shot on goal and pulls it away to the right for a point. The Giants are out to a nine point lead after starting the term off slowly. GOAL GIANTSPatton waits behind the pack and takes a real stand up mark. He kicks from 40m from goal and he kicks his second goal of the day. 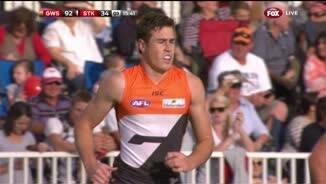 The Patton goal will warm the hearts of Giants fans, with Patton missing the best part of the last two seasons. SUPER GOAL GIANTSPatton marks 55m from goal, with the breeze at his back, he decides to go for goal. He uses the breeze well, pushing it out to the far goal post, with the wind easing it back in. GOAL SAINTSJones with a short pass over to the leading Saunders who marks 15m out directly in front. He has no problem with the kick as the Saints are back in front. BEHIND SAINTSMaister marks just inside 50, he dishes off to Riewoldt who is about the same distance. He takes the shot on goal and pushes it away to the right. A stalemate to start off the second term, with no real advantage for either side at the minute. Second quarter action is under way as the Giants get first use of the ball from the centre square. QUARTER TIMEThe Giants go into the first break holding a slender one point lead over the Saints. Bad news for the Giants, with news coming from the bench is that Coniglio has failed the concussion test and won't take any further part in the game. GOAL GIANTSCameron has taken the advice of Smith and manages to kick his second goal of the day. The Giants have hit the lead. BEHIND GIANTSLamb lets one fly at goal, but it pulls away to the left for a minor score. GOAL SAINTSRiewoldt marks 40m from goal, directly in front. He kicks a goal against the trend of play. There is a certain strut about the Giants at the moment, they are up and about. GOAL GIANTSSmith runs into an open goal and shows Cameron how it is done. Scores are level at the moment. BEHIND GIANTSCameron with a quick shot on goal but he is off target and through for a point it goes. The Giants are not letting the Saints do as they please, as they continue to throw tackles all over the ground. The Saints have lost a lot of experience in the off season and are well and truly into a rebuilding phase. It will be interesting to see how St Kilda's three top 20 draft picks perform during the season. There are some promising signs from both teams at the moment. BEHIND SAINTSA disappointing kick at goal from Hayes, who can only manage a point. Cameron is slow to get rid of the ball and he is wrapped up by Gwilt. Gone! GOAL SAINTSGeary takes it from the stoppage, slams the ball onto the boot and it goes through for a goal. The good news is that the pressure is in the contest from both sides, this may be a close game. BEHIND SAINTSCurren gather the ball, has a shot on goal and it is off target and through for a point. There seems to be a bit of improvement coming through from the Giants. It is scary to think how good their forward line will be when all three young guns are fit and firing. GOAL GIANTSAddison marks it from the kick in and sends it through for a goal. The Giants are in the lead. It has been a lively opening from both teams, as both are on the scoreboard early on. GOAL SAINTSMaister with a slick little handpass over to Weller, who looks up at goal and unloads from 40m out and he drills it. GOAL GIANTSGwilt turns it over as the ball ends up in the hands of Cameron, who runs to the goal square and kicks a goal. Riewoldt is look fit and ready to fire, which is a great sign for the Saints. GOAL SAINTSA free kick down the ground is awarded to Riewoldt, who takes the kick 25m from goal. He makes no mistake as the Saints open their account. Welcome to Wagga Wagga, for the 18th match in 18 days. This final NAB Challenge match is between Greater Western Sydney and St Kilda. IT WAS raining supergoals in Wagga Wagga on Saturday night as Greater Western Sydney gave an indication of its potential with a commanding 68-point victory over a lacklustre St Kilda at Robertson Oval. In a battle of teams tipped to fight for the wooden spoon, the Giants poured in five supergoals in the second term alone and seven overall to turn a one-point quarter-time deficit into a remarkable 58-point lead at the main break. 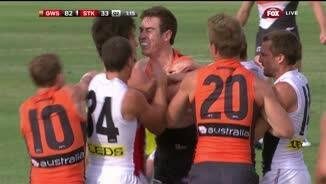 From there it was all GWS, with All Australian Jeremy Cameron kicking four goals and one supergoal in a 7.11.10 (139) to 0.10.11 (71) annihilation of a terribly disappointing St Kilda outfit. Dylan Shiel kicked three supergoals of his own, while Tom Bugg, Adam Treloar, Curtly Hampton and Rhys Palmer all stood out for a Giants side that had winners all over the ground. With Josh Hunt, Heath Shaw, Shane Mumford and Dylan Addison providing some welcome balance to their young list, the Giants look a far more dangerous prospect heading into 2014. "It's just good reward for the boys to know that if they work hard, bring the effort and the energy, they can stay in games," GWS coach Leon Cameron said afterwards. "We got some lucky bounces in the second quarter with some of those nine-pointers, but it is a reward for hard work. 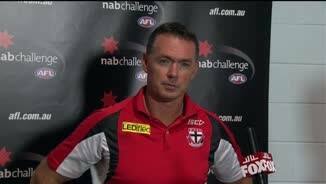 "The (NAB Challenge) game against the Swans last week, they punished us when we made some fundamental errors. "We were probably a little bit better at that than St Kilda today." Both sides were fielding relatively strong line-ups and the result leaves new Saints coach Alan Richardson with plenty of work to do before the season gets underway. Richardson was disappointed with the effort, particularly in the second quarter, but wasn't dropping his head two weeks out from the new season. "We certainly didn't kick the ball well, didn't use the ball well and didn't work hard enough to make the kicks a little bit easier," he said. "Their pressure was really good and that was the disappointing part, particularly in the second quarter, that we didn't cope with that pressure. "We'll make sure we work on that really strongly." The coach also said Lenny Hayes had got through the game well, following an early television suggestion he had tweaked a hamstring. Nick Riewoldt kicked two first-quarter goals and Jarryn Geary and Jimmy Webster had their moments, but it was otherwise a poor showing from the Saints, who face Port Adelaide in their final hitout next weekend. An apparent hamstring injury to Lenny Hayes only added further injury to insult for a St Kilda side already missing best and fairest winner Jack Steven for the next two months with a broken foot. In a town that produced footballing royalty in Wayne Carey and Paul Kelly, it was modern day heroes Riewoldt and Cameron who got their respective sides underway in the first quarter. Riewoldt got the opening goal on the board in the second minute of the game courtesy of a free kick against GWS co-captain Phil Davis, a scenario that would repeat itself at the end of the term. Cameron also kicked two goals in the first quarter, getting the better of a tight duel with James Gwilt, as the Giants took a one-point lead into the first break. 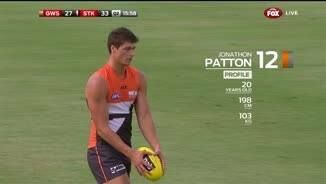 While the first term was an arm wrestle, the second was an absolute avalanche, starting with a supergoal and a goal from a fresh looking Jonathon Patton. Nick Haynes, Dylan Shiel, Will Hoskin-Elliott and Cameron all got in on the supergoal action as GWS tore the game wide open. The Giants missed some opportunities in the third quarter, but still managed to stretch the lead to 68 points before romping home in the final term. Greater Western Sydney: It was only a trial match, but the signs were clear that the Giants should take a significant step forward this coming season. The mature-aged additions have filled some holes and the glut of young talent is making the necessary improvements. St Kilda: Alan Richardson has a mammoth job on his hands. Talent is one thing, and the Saints aren't exactly overflowing with that, but their work rate was also well down on their opponents on a disappointing afternoon. Greater Western Sydney: For a 19-year-old playing his first senior game, Josh Kelly was far from overawed and showed some good hands and a calm approach. Jed Lamb was dangerous around the half-forward line, while Dylan Addison spent time at either ends of the ground. St Kilda: First-round draft picks Jack Billings and Luke Dunstan were given an opportunity against the Giants. Dunstan managed to pick up 22 touches and kick a goal, but it was a tough night for Billings. Former Brisbane Lion Billy Longer, who has added some muscle to his frame, had some good moments in the ruck. Greater Western Sydney: Townsend replaced Coniglio at quarter time; Plowman replaced Mumford in the final term. St Kilda: Schneider replaced Billings at quarter-time; Ross replaced Delaney in the second term; Delaney replaced Gwilt in the third term. Reports: Townsend (GWS) reported for high contact on Armitage in the fourth quarter.